Armenian Christmas, Theophany, Epiphany, “Little Christmas”, and especially “Le Petit Noël”: trying to make sense of a December 23, 1905 cartoon and its caption. The Gregorian calendar that we are all familiar with was promulgated during the reign of Roman Catholic Pope Gregory XIII. The order for change was issued as a Papal Bull in 1582. According to Christian tradition, the celebration of epiphany or theophany, 12 days after Christmas, commemorates the manifestation of Jesus as Son of God through his baptism and at the same time, the manifestation of the Holy Trinity. For some, it also signifies the manifestation of Jesus to the Magi etc. The Armenian church celebrates the Nativity as Part of the Theophany/Epiphany. This year the “Feast of the Nativity and Theophany of Our Lord Jesus Christ” falls on a Friday, the date stands as always at 6 January according to the Julian calendar. Some will recall that we have an interest in cartoons. Some of these are not always easy to interpret. After all, in many cases the ones of special interest to us are much more than a hundred years old. Inevitably, it is often a challenge to contextualize the images precisely. Most of the time, they are not for some of us today what they might at first glance appear to be or represent. Sultan Abdul Hamid II was a cartoonist’s and caricaturist’s dream fulfilled. In like manner, German Kaiser Wilhelm II easily fell into the same category – some might say they were meant for each other and often shared the same tableaux. Not so long ago, when going through our collection of cartoons, we encountered an issue of L’Assiette” captioned NOЁLS! [Christmases] - 23 December 1905 issue No. 247) featuring images by [Tomas] Leal da Camara (1876-1948. Camara was born in the Portuguese colony of Goa, now the Indian state of Goa, and operated out of several locales over his career and ultimately from the small city of Porto near Lisbon in Portugal where he died). We think he was incredibly talented and quite original in his themes and depictions. While all the caricatures in that issue with cartoons by Camara are very interesting, the ones that especially attracted us were in a cartoon on page 622 entitled “Le Petit NOЁL de l’Europe” [The Little Christmas of Europe]. We are all familiar with Santa Claus, and some of us with Father Christmas, Armenians with Gharant Baba, Spanish speakers with Papá Noel, Italians with Babbo Natale, French speakers with Père Noël. We suspect fewer will be familiar with Le Pétit Jésus or le Petit Noël. In any case, he may perhaps be best described as a giver of gifts represented in one way or other by or with the baby Jesus. In this cartoon Little Santa Claus is hardly ‘little’ and he is hardly the helper one would like to imagine or picture as a ‘Santa’s helper’! Against this minimal background, we can see in the cartoon a huge, uniformed, thuggish, avaricious-looking hoodlum and bully in the form of German Kaiser Wilhelm II. He is clutching in his left arm the Sultan of Morocco, Mulai Abd el-Aziz. The Sultan seems very distressed. The thug clutches the wily Turkish Sultan Abdul Hamid II in his right arm. Sultan Abdul Hamid displays a less distressed and more resigned gaze. The thug is grabbing [‘be-gifting’ himself?] with the Turkish Empire and hopefully, Morocco (Morocco, unlike Algeria was never a part of the Ottoman Empire). The Kaiser had already secured the cooperation, and even compliance of the Turkish potentate and had considerable influence at Constantinople. The influence of the British at Constantinople was described as “nil” in this period, partly as a result of the outcry occasioned in England over the Armenian massacres. These had gone far to alienate her from the Sultan. Recall that it was around this time that the pejorative epithets of “Abdul the Damned”, “The Red Sultan” and “The Great Assassin” were cast on Abdul Hamid. On the other hand, Germany at the time of the massacres and after, had reached out to the Sultan and Kaiser Wilhelm II was warmly received by the Sultan on two visits. The extended hospitality was given if only to make it clear that friendliness from a power in Europe like the German Kaiser was most welcome. For this, the always-suspicious and wary Sultan had granted privileges to Germany in railroad building etc. The Sultan of Morocco was placed in a bind when the Kaiser invited himself and made a sojourn to Morocco in the form of a state visit - he was supposedly only actually seeking an appropriate port on Morocco’s Atlantic coast. (Germany claimed it had no territorial interests.) France, of course, viewed Morocco as in her purview. Her colonies in French West Africa were big-time investments, and were a source of raw materials, and hence revenue. The efforts of France to ‘civilize’ (and exploit) Morocco were seen as very appropriate, and ‘natural’, and indeed England thought that France would be the best civilizing influence - even more so than she (in reality Britain having bigger fish to fry). As long as the Straits of Gibraltar were kept open for England, John Bull could care less about Morocco. Any visit from German Kaiser Wilhelm II in Morocco was seen by France as a severe and unacceptable encroachment. After all, “l’honneur de la France” [the honor of France] was at stake. At a different time, it would have been seen per se as a cause for war. The imagery of the cartoon is fairly clear-cut. Sultan Abdul Hamid II looks pretty much as he should in caricature. See for example cartoon images in our Groong Papers cited in the Appendix. However, the depiction of Kaiser Wilhelm II is a bit atypical. This image looks more ‘generic’ and gross if you will. Some of the early British cartoons of the Kaiser show him to be rather heavy. Here, he lacks the moustache so typical of him in later caricature. But, he is abundantly militaristic and wears the Prussian Pickelhaube spiked German helmet. Note also that he wears a cannon-shaped ear ring in his right earlobe - presumably to hint that he has inclinations to behave like a “grabby” pirate anxious for plunder. He also wears a cannon pendant around his neck. Kaiser Wilhelm certainly would not have appreciated this insulting imagery. We shall forego here any opportunity to say anything about cartoons wherein Germans are represented as Huns. 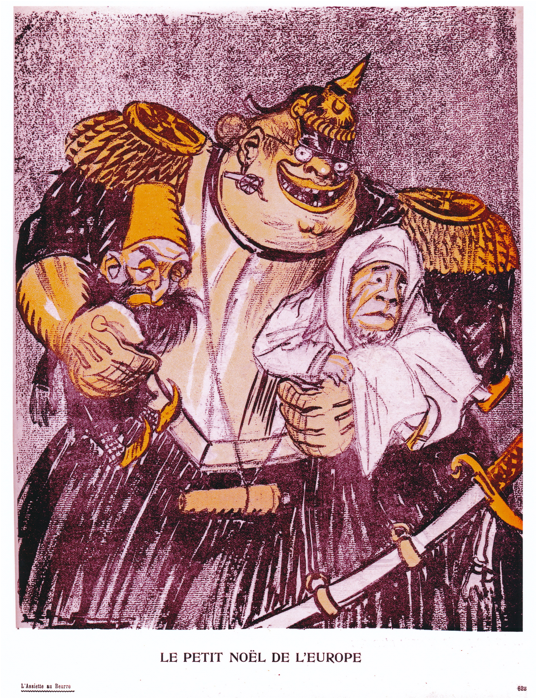 In future, we will take the opportunity to concentrate on Kaiser Wilhelm II and Sultan Abdul Hamid II in caricature and cartoons and their significance for Armenian issues and massacres in particular. To wrap up this short presentation on this initially elusive cartoon, we shall merely end on this note. Christmas presents, after all, are Christmas presents – no matter their nature, size, source or value. Copyright 2017 Armenian News Network/Groong. All Rights Reserved.